I have been humbled and thrilled with the success of the Rustic Beads and Components Tutorial. A huge thank you to everyone who bought it, played with it, blogged about it, and shared their experiences with it. It was so much fun that I wanted to make a “More Rustic Beads” tutorial as a follow-up. So I started experimenting with bead shapes and finishes. But what actually came out of my hands didn’t really look very rustic. These new beads looked organic, exotic, like they were found on the ground, shaped and worn by the processes of nature and then tweaked and enhanced by the artist’s eye. So I named this process (I’m so original) the Organic Beads Technique, and you can learn how to do this yourself with the Organic Beads Tutorial for polymer clay. The process of creating these polymer clay bead shapes is also what’s called an “organic” process. It sort of grows and develops in your hands. You will be the one creating the shapes, from scratch, and although you can make matching shapes (such as earring pairs or bead sets) each bead will certainly have a life of its own. This is a process that will make beads unlike anyone else’s. Your beads will be unique and entirely your own creation. There are no commercial molds used. Once you create the shapes, you’ll learn how to decorate them with those wonderfully warm and soft colors. You can use any color, not just the bright ones that my hands seemed to create in some of the batches. (I blame the weather.) Some of mine came out looking like old bones, others like bright coral, a few like old jagged jewels. There is lots of room here to be as creative as you want to be. But it’s also an easy and forgiving enough process so that you’ll have great results the first time. This tutorial is 61 pages long and I was stunned to count 185 pictures! My tutorials are nothing if not clear, eh? This process doesn’t require a pasta machine, doesn’t require sanding, and you’re not going to need to worry about fingerprints. In addition to the basic process of the tutorial itself, I pack this tutorial full of tips and information that you’ll use with your other polymer clay work as well. All of the materials used in this tutorial can be purchased in most craft stores. This tutorial does use 2-part silicone mold putty, but if you can’t find that I do show how to make an alternative that works almost as well. The mold putty is the only expensive item. The rest you’ll either have on hand already or can buy easily and cheaply. And anytime I make beads, I strongly recommend Amaco Bead Piercing Pins, so try to get a package of those as well. 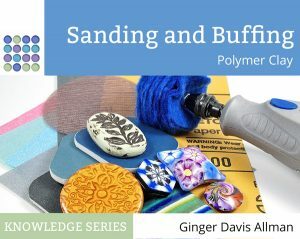 This is a beginner level tutorial that does not require any previous polymer clay experience, but if you’re totally new to polymer clay I do recommend that you also get the Getting Up to Speed in Polymer Clay informational primer. That will fill in the gaps and give you the background that you’ll need to work with polymer clay. This is a technique-based tutorial. So rather than having one or two set projects, you’ll learn the techniques to create these beads so there is room for lots of variation. And this tutorial is designed to be compatible with and a companion to the Rustic Beads Tutorial. You can use the shaping methods of each tutorial with the coloring techniques of the other. So you can have Organic Bead shapes that are colored in the style of the Rustic Beads. Or you can have Rustic shaped beads and then color them in the style you’ll learn in this Organic Beads Tutorial. Ready to give it a try? Then head on over to the shop and get started! Thank you so much. It’s always scary to put your own work out there, so that really makes me feel great to read your comment. Have a great day, Jacqueline! You must have more than 24 hours in the day, Ginger! Not only are you blogging, facebook-ing and browsing through all the polyclay goodies out there, but you also have time to experiment and play and come up with more great techniques for the rest of us to enjoy! I love the look of these beads and as you can guess l don’t think l’ll be able to resist following your etsy link……. Another fabulously written and illustrated tutorial full of endless possibilities. After reading it, I am looking at objects all around me in a totally different way. I’m keen to buy one of your ebooks and I was wondering if you could offer a recommendation. I’d like to create some faux gemstones — mother of pearl, malachite, carnelian, and tigerseye. Do you think your “Organic Beads” tutorial would be my best bet? I realize it probably wouldn’t have the exact methods for what I want, but do you think working from what you have in the tutorial I could come up with some good results? 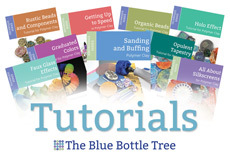 No, the Organic Beads tutorial is very different. I don’t really have a tutorial that is similar to that. I know that Lynda Moseley’s Masterful Faux tutorial (https://www.etsy.com/listing/175568751/polymer-clay-tutorial-english-only-pdf) makes wonderful faux turquoise veneers. And the gold standard for those type of faux gemstones is the Polymer: The Chameleon Clay by Tory Hughes https://www.amazon.com/Polymer-Chameleon-Techniques-Re-creating-Turquoise/dp/0873493737/ref=sr_1_1. Also, Randee Ketzel and Kim Schlinke have a great book on gemstones, https://www.amazon.com/Polymer-Clay-Gemstones-Art-Deception/dp/098003129X/ref=sr_1_1. Thanks so much, Ginger! I appreciate your advice and recommendations. I will take a look for those books.